After dumping my Palm Treo 700w, which I had used during my previous 2-year contract with Verizon Wireless, I’ve moved onto bigger (or smaller?) and better things. The two phones that I’m using now are the BlackBerry Pearl 8130 (when I’m USA) and the HTC Touch P3450 (during my visits to China). 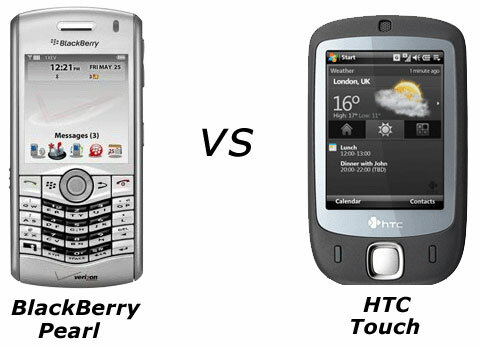 To get an idea of the relative sizes of the two phones, the above picture shows that the Touch is slightly wider than the Pearl, but the Pearl is a little longer than the Touch. In terms of thickness, the two phones are about the same, but since I use a silicon rubber case on my Pearl, it is slightly thicker.